Difference between the Keurig K55 and K200 - Which model is better? The range of Keurig coffee maker models is really wide and it must be rather hard for you to choose one, unless you are a coffee geek who knows everything about all Keurig models. K55, k200, b150, K250, k45, k475, Keurig 1.0, and Keurig 2.0 – all these names must be confusing for an average person who is not as passionate about coffee as our Coffee Supremacy Team. We’re here to inform you about different Keurig models. We’ll show you the differences between them and give you suggestions on which one to choose. Today, we will compare the Keurig coffee machines K55 and K200. You can learn more about the differences between these two Keurig coffee maker models in our comparison table. 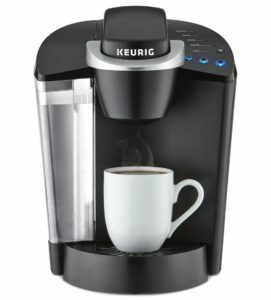 The K55 belongs to Keurig 1.0 Classic product line, whereas the K200 belongs to Keurig 2.0 product line. 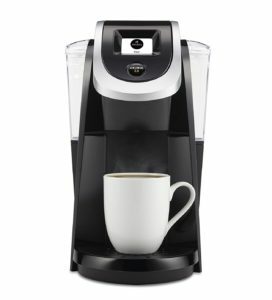 If you don’t know the difference between Keurig 1.0 and Keurig 2.0, to make a long story short – the most important differences are: some K-Cups are not compatible with Keurig 2.0 system; Keurig 2.0 has touchscreen control, not buttons; it can brew a full 4-cup carafe and has a more advanced brewing method with strength control. We will now look back at these two Keurig coffee machines that caught our attention. The Keurig K55 is still the best selling single serve coffee maker on Amazon. Eventually, people always find it the best value for money, which it definitely is. The only disadvantage is that the coffee maker doesn’t come with a thermal carafe, because it’s just a single serve brewer. If you need some fancy features like touchscreen, different colors to choose from and more brew sizes, then the K200 might be better for you. Some people complain that the K55 is too noisy, so you should know that all Keurig 2.0 models are quieter than Keurig 1.0 models. However, we love the good morning song from our Keurig K55. Besides, the song is not too loud and takes just a few seconds. The price of these two Keurig coffee makers is almost the same, although the K55 is a little cheaper than the K200. If you’re looking for really cheap K-cup compatible coffee makers, you must look at our Best cheap K-cup coffee makers list. These inexpensive coffee makers are very reasonable alternatives to Keurig’s, but for less money. The price of the K200 is not the same for all colors. The more unusual the color – the more it costs, but not a lot, usually only about 10$ more. If color is important to you and you want your coffee maker to look nice on your kitchen counter, the K200 offers more variations than the K55 (which offers just two colors: black and rhubarb) and more variations than other Keurig models. Another important difference between the K55 and the K200 is the water reservoir. Both water reservoirs are removable, but the K55 has a bigger reservoir (48 oz) than the K200, which has a 40 oz water reservoir that requires frequent refilling. Another great advantage of the K55 is that it can work with unlicensed K-cups, while the K200 works only with Keurig brand pods. When you try to use non-Keurig pods with the K200, you get an error message on your touchscreen and a phone number to order Keurig pods. In the K55, you can use a variety of different brand K-cups. The most important advantage of the Keurig K55 is that this machine, in our experience, is made to last. Some of us have had them for 5+ years and they all run like clockwork. There are also more complaints about the K200 than the K55. If you are interested in a Keurig 2.0 coffee maker, it’s better to choose the K475 or the K575 than the K200. Yes, these are a little more expensive Keurig machines, but they are certainly better than the K200. At the end of this Keurig coffee makers battle, if you still have a dilemma on your mind whether to choose the K55 or the K200, we recommend you buy the K55. If you have a different experience or opinion about these Keurig coffee machines, share it with us in the comment section.